The Tax Cuts and Jobs Act of 2017 changed the Income Tax rules in many ways. The net effect of these changes will undoubtedly drive most individual filers to claim the standard deduction instead of itemizing. That is unless you consider Charitable Giving - a tax benefit to which many tax filers avail themselves. Check here if you don't believe me about how much money flows to charitable organizations. The deductibility of Charitable Contributions remains in full force and has become an area ripe with financial planning opportunities. The Tax Cuts and Jobs Act of 2017 introduced a bevy of changes to the tax code. Most of these changes dealt with business deductions, which is a very, very in-depth topic well beyond the scope of this article, or perhaps any one article. The changes to Individual Income Tax rules are a bit easier to digest in one article. 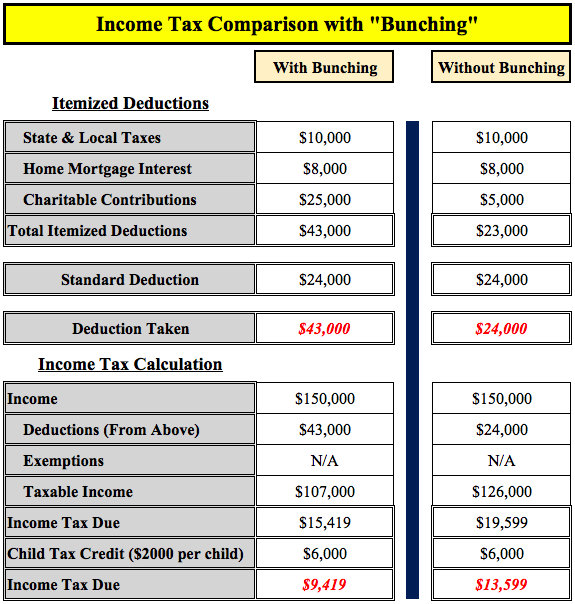 The Standard Deduction. One of the key aspects of the Income Tax changes is the expansion of the Standard Deduction. For 2018, the single standard deduction is $12,000 while the married standard deduction is $24,000. These amounts were $6,350 and $12,700 previously. You can add an extra $1,300 for any filer over 65. Personal Exemptions. These no longer exist in the tax code. Instead, the Child Tax Credit has been dramatically expanded to $2,000 per child for married filers with incomes up to $400,000 and single filers with incomes up to $200,000. Itemized Deductions. The biggest change here - and you have probably read much about this in the media - is the limitation of State and Local Tax (SALT for short) deductibility to only $10,000. This deduction was previously unlimited. Charitable Deductions are still fully deductible. However, Mortgage Interest has been limited somewhat to the first $750,000 of mortgage debt, though there are some exceptions we will skip here. And finally, Miscellaneous Itemized Deductions have been eliminated completely. Those are just highlights from an otherwise very large set of changes. Please, and I repeat please, do not use what is written here to take specific tax-related actions. Rather, consult a trusted tax advisor for advice on your own unique circumstances. As you can see, the tax savings are indeed real. The numbers in red (for emphasis) highlight the Standard Deduction increase, the elimination of Personal Exemptions, and the $2,000 per Child Tax Credit. Collectively, these changes would result in a tax savings of ($17,665 - $13,599) $4,066 for our hypothetical tax payer. Careful readers will note in the '2018' example above that the Standard Deduction was taken. Since the Itemized Deductions only totaled $23,000, obviously the filer would claim the higher standard deduction. While most givers are indeed altruistic, it is certainly understandable that when possible, one who donates may want to receive "tax credit" for her giving. 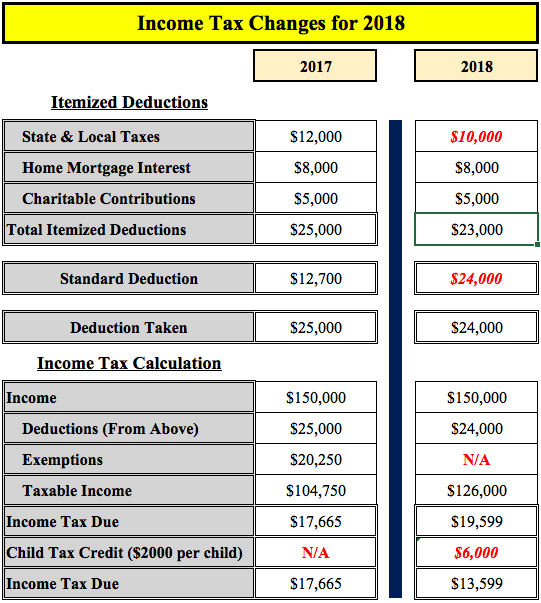 As you can see in the red highlighted numbers, the $25,000 current year donation will inflate the total itemized deduction to $43,000, which exceeds the $24,000 Standard Deduction. By donating $25,000 now, which is the same amount she intended to donate over the entire 5-year span, she has increased her overall tax deductions for 2018-2022 by $19,000. 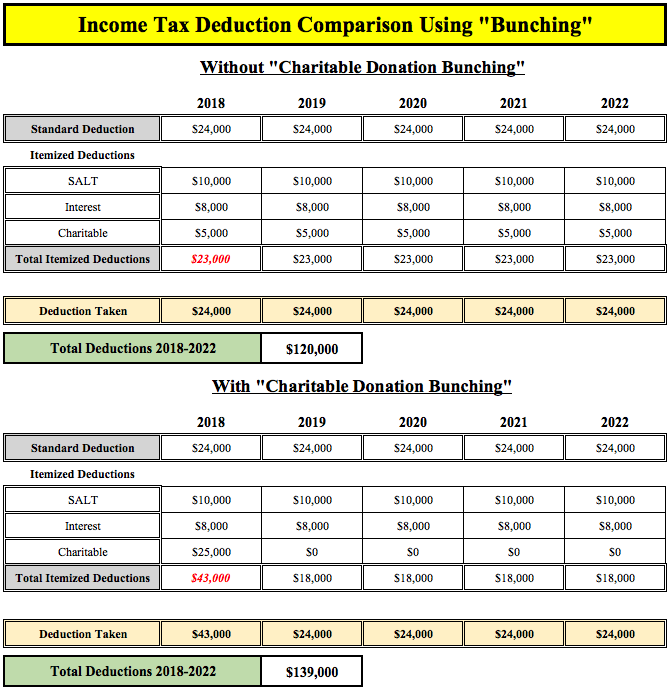 As you can see, the one-time $25,000 donation ballooned the Itemized Deductions up to $43,000, which reduced the tax bill by ($13,599 - $9,419) $4,180. Sometimes individuals who donate to charity do not want to endow funds all at once. Rather, they would like to meter out funds to a charity, or group of charities, over time. This giving technique may be of particular interest to those employing the "bunching" technique described above. For those looking to donate funds over a period of time, a Donor Advised Fund is the tool of choice. 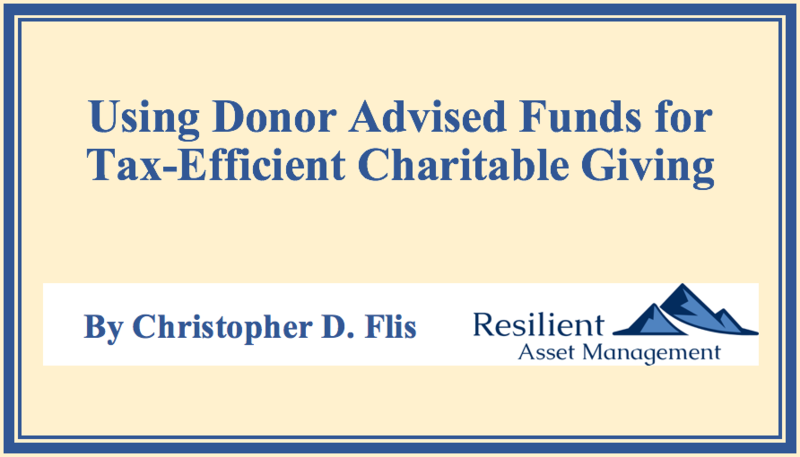 A Donor Advised Fund (DAF) is a tool used to allocate charitable contributions over time. In effect, Donor Advised Funds act like a "mini-foundation" for individuals to grant funds to charities of their choosing over an indefinite time horizon. The process for establishing a DAF is remarkably simple. Practically speaking, the steps are very similar to opening a regular brokerage account. With a DAF, however, the "owner" of the account is a qualified Trustee who is legally able to administer DAFs. After establishing the account, the donor makes an irrevocable donation to the DAF. Once the funds are in the account, they cannot, under any circumstances, come back to the donor...the gift is irrevocable! With the administrative matters complete, the Donor (remember it is a Donor Advised Fund) makes "grants" of the funds within the account to qualified charities. Typically, the Trustee you use will have a database of qualified charities to whom you may make grants. The Trustee will likely also have a mechanism to vet any qualified charity you elect and can add the charity to their database. The Donor simply instructs the Trustee where to send the funds. There are no requirements for annual grants or further donations. Therefore, you may elect to invest the funds as you would with any other brokerage account so the assets may hopefully grow over time. Most Trustees will charge a yearly administrative fee - around $300 per year is pretty standard - for their services. The account minimums for establishing a DAF are remarkably low - usually $5,000. These low minimums make DAFs accessible to a wide swath of the charitably inclined. Since the funds are in a charitable account, there are no tax consequences for any investment gains. Though, of course, you cannot claim any losses on the funds either. Obviously, to effect the "Bunching" strategy as described here, the donor must have the required funds on-hand. Moreover, replenishing the funds over the ensuing years is suggested to keep the overall financial plan on track. So, please consider your overall financial plan before embarking on a Donor Advised Fund journey and don't become enamored with unnecessary "tax motivated" strategies. Indeed, even the use of "bunching" offers only modest tax efficiency. In closing, for those with adequate funds, the Donor Advised Fund is a very good way to take advantage of the tax savings allowed by our new Tax Code.